As the day gradually approaches for the planned protest led by pop star 2face Idibia, the police has issued a new warning against proceeding. The Nigeria Police Force has strongly advised Innocent Idibia (a.k.a 2face) and his group to shelve their planned peaceful protest/demonstration in the interest of peace and security in the country, the News Agency of Nigeria reports. The Force Public Relations Officer, CSP Jimoh Moshood, gave the advice in a statement issued to newsmen in Abuja. 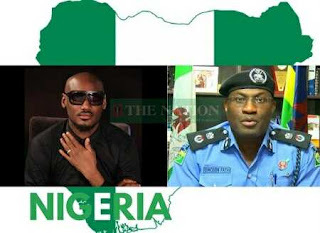 “The attention of the Nigeria Police Force has been drawn to publications in the media on the planned protests slated for Feb .5 and Feb. 6 , 2017 in Lagos and other States by different groups, one to be led by the popular musician Innocent Idibia aka 2face and other opposing groups. Moshood said the Nigeria Police Force was prepared to employ every possible legal means for the maintenance of law and order; and for the protection of lives and property. “Consequently, members of the public, parents and guardians, religious/opinion leaders and other interest groups are strongly advised to prevail on their children and wards, followers and adherents not to allow themselves to be used by any group to cause disturbance of public peace and break down of law and order,” the police spokesman said.